Emre Can celebrates a Liverpool goal. 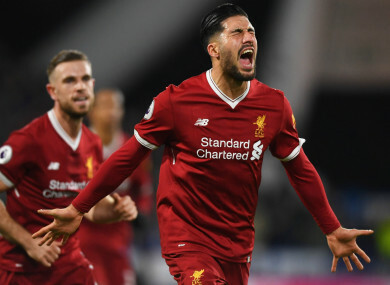 LIVERPOOL MIDFIELDER EMRE Can has hit out at what he describes as “false stories” relating to his reported wage demands. The Germany international has been heavily linked with clubs including Manchester City, Juventus and Bayern Munich, with his contract due to expire at the end of the season. Reports in England have claimed Liverpool will have to offer Can £200,000 a week to convince him to stay at Anfield, and the 24-year-old says he is tired of such speculation. “I’ve just returned from international duty with the German team and working on coming back from injury,” he wrote on Instagram. “Interesting stories about me in the press! Can has made 26 Premier League appearances this season, scoring three goals for Jurgen Klopp’s side. He was released from the Germany squad after missing last Friday’s friendly draw with Spain due to a back problem. Email “Liverpool's Emre Can hits out at 'false stories' regarding his future”. Feedback on “Liverpool's Emre Can hits out at 'false stories' regarding his future”.